How I fell in love with prefelt. Big discovery. If I use dyed prefelt as a base instead of silk (ala nuno felting), the process is much faster, more spontaneous and therefore much more fun for me. 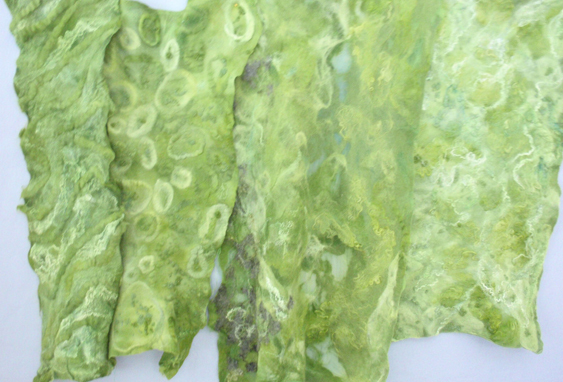 AND the result is a visually interesting, highly textured fabric that I can’t wait to cut up and sew. Look closely. 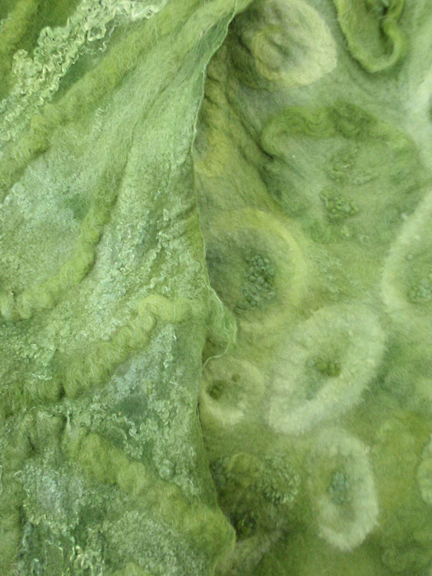 These are two different felted surfaces next to each other for contrast. You see pencil roving, merino fibers, bombyx silk (amazing stuff) and tiny felted balls called “nebs”. (hint: put your nebs in an old piece of socking to dye. Otherwise: neb chaos!) These were all dyed together with the underlying prefelt but took up the dye with enough variation that subtle lovely differences in value resulted. Here’s my design wall with the four finished felt pieces. They look like pelts from a Dr. Seuss menagerie. By the way, I’m now a no-roll wet felter. Life’s too short. 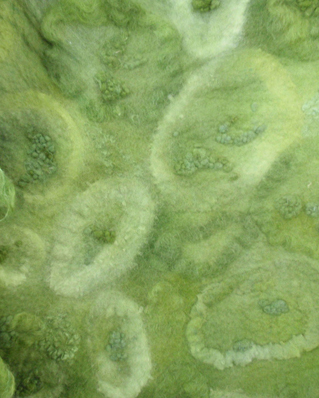 This entry was posted on January 30, 2013 at 10:20 am and is filed under felting, Inspiration, Process. You can follow any responses to this entry through the RSS 2.0 feed. You can leave a response, or trackback from your own site. Absolutely! You were a major contributor to this enterprise! There’s nothing like felt for texture. Gorgeous. And it’s so much fun to sew!